An extremely scarce original poster print, hand coloured by CFA Voysey himself and signed verso “CFA Voysey, ARCHT. INVT. Et DELT, 1917”. h: 30” w: 27” inc frame. Provenance & History: Originally purchased by the State Management Scheme, through Charles Thurnham of Carlisle. Thurnhams Library label to reverse inscribed “Control Board, Clerk of Work’s Office, 28 Castle St”. Harry Redfern, the architect of the State Control Board, was a great admirer of CFA Voysey. 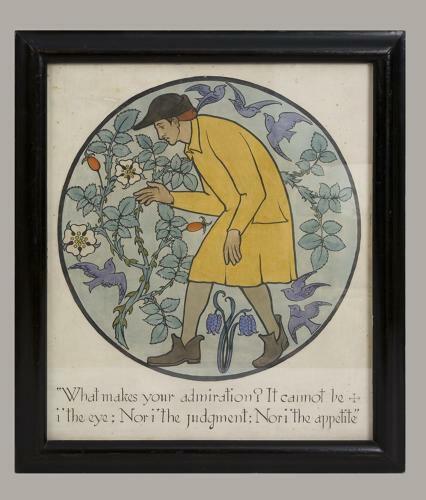 Between c1915-1918, Voysey designed several posters for the Central Liquor Control Board, to decorate pubs and canteens, mainly in the Carlisle area, run by the State Management Inns, with quotations and aphorisms and colour illustrated with pictures in roundels, such as this. The posters were printed by the “Sun process” and hand coloured by Voysey himself. The motifs sometimes resemble other Voysey designs, such as this one being similar to a design he used for his inlaid workbox in 1893 with the motto “Head Hand & Heart”. Pictures such as these, decorated the interiors of the State Management Inns in Carlisle. At the time of the First World War, the countrys largest munitions factory was built just north of Carlisle and the huge influx of single men workers with disposable incomes naturally had an effect on the liquor trade in Carlisle. This in turn had knock-on effects on munitions production and safety. So the government set up a Central Board (Liquor Traffic) to control the nations drinking habits in times of war. One of the measures introduced was limiting the opening hours to 11 a.m. to 3 p.m. and 6 p.m. to 10:30 p.m.; curiously, this lasted till 1988. It was thought at the time that these posters would help re-focus the minds of the drinking men to other useful earthly pursuits! Ref: Catalogue of the Drawings Collection of the Royal Institute of British Architects: CFA Voysey by Joanna Symonds page 73 . Catalogue of an exhibition of the work of CFA Voysey held at the Batsford Gallery, 1931 page 4.